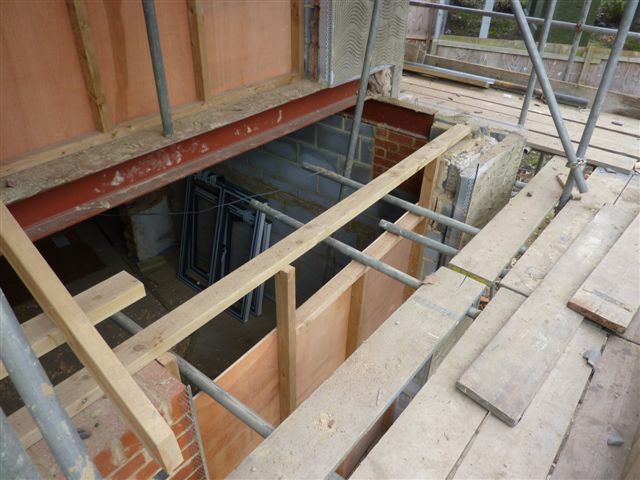 A London construction company and the director of a Hertfordshire roofing firm have been fined for safety failings after a worker was seriously injured when he plunged almost six metres through a void for a roof light. The roof light void where the fall occured The self-employed roofer, who does not want to be named, broke and fractured several bones in his back and bruised his diaphragm, lungs and thigh in the incident in Brent on 29 February 2012. He was unable to work for 14 months and still requires hospital treatment for back problems that have forced him to seek alternative employment. The fall occurred while he was under the control of Rickmansworth-based John Donald, trading as John Donald Roofing. The director had in turn been sub-contracted to undertake some of the roof work by Golders Green-based Right Angle Ltd, the principal contractor for a project that involved refurbishing and extending three residential properties. The Health and Safety Executive (HSE) prosecuted both parties after identifying a number of safety failings across the site as well as those linked to the roof work. Westminster Magistrates Court heard (on 16 July) that the injured worker, then aged 28, fell as he cleared materials from a flat roof. He picked up a piece of ply board that he assumed was debris without realising it concealed a roof light void beneath. He fell feet first through the void and landed on the first floor some 5.6 metres below, fracturing his spine on impact. HSE established that the measures taken to mark and protect this and other similar voids were totally unacceptable, and that any number of workers could have suffered a similar fate. Further failings included fall risks in other locations at the site, such as the edges of the flat roofs where there was no edge protection, fall risks on the scaffold, open joists, and open staircases where there were no handrails. Other issues were also identified across the site, including fire risks and inadequate fire prevention measures; numerous slip and trip hazards caused by excess rubbish and debris; and glazed window frames stored upright and unsecured that were liable to fall and cause injury. The court was told the fall was entirely preventable had the void been clearly marked and better protected, which was the responsibility of both defendants, and that moreover Right Angle had failed to properly plan, manage and monitor the construction phase. Right Angle Ltd, of Finchley Road, London, NW11, was fined £15,000 and ordered to pay full costs of £5,375 after pleading guilty to a single breach of the Construction (Design and Management) Regulations 2007. John Donald, of New Road, Croxley Green, Rickmansworth, was fined £4,000 with £3,965 costs after admitting a breach of the Work at Height Regulations 2005. “There were numerous failings on the part of Right Angle Ltd that exposed multiple operatives to a host of foreseeable risks, including falls, slips and trips. “John Donald has to accept culpability as an experienced roofer who should have known better. He instructed the injured worker to work in an unsafe area where there were wholly insufficient measures in place to prevent or mitigate a fall.